Year Four comes back to us in bits and pieces. There was no overriding event or personality that year. Instead, BIFF 2008 was like a firework exploding in the night – a thousand flashes of color that lit up the landscape. The premiere of Helen Hunt’s directorial debut, “Then She Found Me,” on opening night (Valentine’s Day, don’t you know!). Hazel Miller sang the night away. 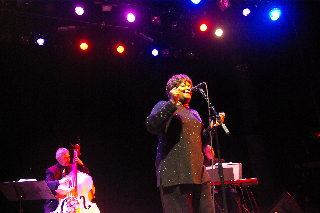 Denver diva Hazel Miller entertains on BIFF's opening night in 2008. Seeing Alex Gibney’s amazing and profoundly disturbing feature documentary, “Taxi to the Dark Side.” A week later, it won an Academy Award. “3 Peaks, 3 Weeks” – Michael Brown’s doc about 10 women climbers assaulting the three highest peaks in Africa brought together the intrepid mountaineers for the first time to see the completed film and interact with the audience. The women who were the subject of Michael Brown's "3 Peaks, 3 Weeks." Offsite, BIFF worked with the International Film Series to present the original cut of Richard Kelly’s enigmatic epic, the failed“Southland Tales” in Muenzinger Auditorium. That same weekend, Sergei Eisenstein’s epic historical drama “Alexander Nevsky” was screened at CU-Boulder’s Macky Auditorium, with the Boulder Philharmonic playing Prokofiev’s classic score live. Over at the Filmmakers’ Panel, Film Threat’s Chris Gore led a hilarious and too-short session about how to get backing a film idea, which climaxed with taking aspiring filmmakers out of the audience and subjecting them to impromptu pitch sessions. 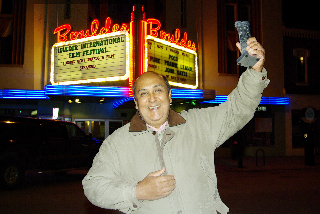 Among the five sell-out shows at the festival were “Les Paul: Chasing Sound” and “Dalai Lama Renaissance.” The latter was so popular that a second screening was added – a BIFF first! The Festival’s powerful closing night film, “Stranded: I’ve Come from a Plane that Crashed on the Mountains”, a documentary about the infamous 1972 Andes plane crash, was followed with a Q&A session with Antonio “Tintin” Vizintin, a survivor of the horrific crash who traveled to Boulder from his home in Montevideo, Uruguay, to help present the film. The sold-out crowd was mesmerized as Tintin described the harrowing 73 days he spent in the Andes and the impact of the crash on his life.